Do You Need to Wear a Spacesuit on the Moon? Surprisingly, no! With a few caveats: you'll have to wear warm socks and shoes, a mask hooked up to an oxygen supply, and you better keep on the dark side of the moon (or the shadows of the light side). You won't be comfortable... but the temperature, radiation, and vacuum won't kill you immediately. Neil Armstrong, partially suited up. From a stain glass panel at the Naval Museum in Valparaiso, Chile. Since the moon doesn't really have an atmosphere, there's nothing insulating its surface from wild temperature swings. It gets as cold as nearly -250 Fahrenheit in shadow or on the dark side and up to nearly 225 Fahrenheit in the sun. On Earth, either extreme would quickly be fatal to an unprotected human. And on the light side of the moon, heat radiating from the sun would be dangerous. But the dark side of the moon is a different story. In the near-vacuum of space, your body is far slower loosing heat than here on Earth, because there is no air to conduct heat away from your body. That's why -250 Fahrenheit in the near-vacuum of space would not feel horribly cold. However, if you touched anything at the ambient temperature of the dark side of the moon, you'd feel quite a chill, because matter will conduct heat efficiently, unlike the vacuum. So, you'd just need to wear boots with well-insulated soles, otherwise the bottoms of your feet would quickly freeze and would conduct away heat from the rest of your body too. Well-insulated gloves would also be a good idea if you plan to pick up any moon rocks! 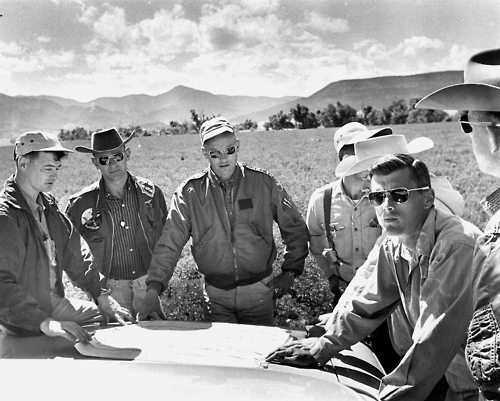 Al Bean, Neil Armstrong, and Roger Chafee completing pre-mission geology training. As long as you can breathe, the vacuum does not pose as big a risk to the rest of your body as you might think. We regularly experience changes in air pressure here on Earth, by swimming underwater or climbing a mountain or flying in a plane. Walking around in an absolute vacuum would draw fluid to your skin, breaking some small blood vessels at the surface and bloating you. But in the short term, you wouldn't inflate like a balloon or explode or anything gross, you'd just look puffy and feel uncomfortable. Preferably, your breathing apparatus would cover your eyes, nose, and mouth. Otherwise the moisture in your eyes, nose, and mouth would evaporate quickly into the vacuum. And, your exposed skin would dry out uncomfortably. Eventually, radiation would become a concern, too. 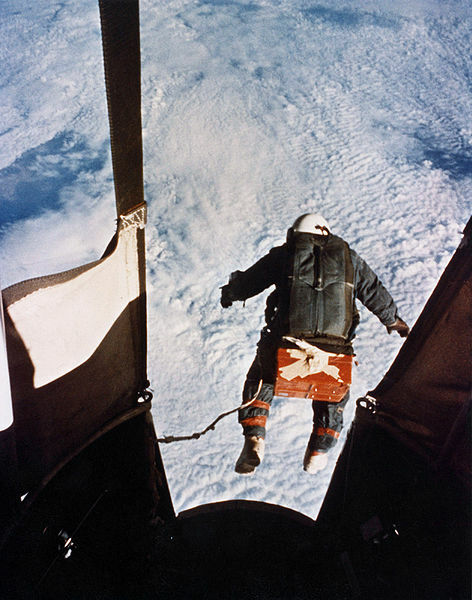 During a record-breaking high-altitude jump, Colonel Joe Kittinger 's right suit glove depressurized in near-vacuum. His hand didn't explode, but it did swell up painfully. So for all those reasons, and because anyone in sunlight would overheat without insulation, astronauts on the moon or on spacewalks wear spacesuits. These bulky, heavy, mobility-limiting pressurized suits (including life support systems, the typically extravehicular activity suit weighs over 300 pounds!) insulate astronauts as they move between shadows and sun. They also provide some radiation protection, and they prevent skin from swelling up uncomfortably. The whole suit is pressurized, but since it is hard, rather than soft, it does not puff up and make joint mobility difficult, and can also be more pressurized than a "soft" suit. 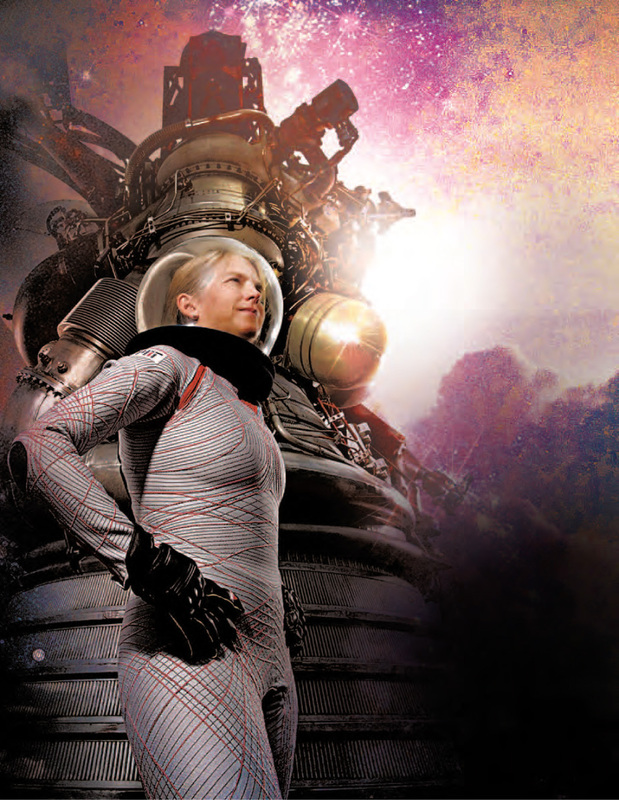 But there is an alternative to the traditional, fully pressurized spacesuit we're used to. Astronauts could wear a mostly unpressurized spacesuit. The entire suit body could be unpressurized, except for the helmet and maybe the gloves and boots. The main function of an unpressurized spacesuit is to provide insulation, radiation protection, and prevent vacuum-induced swelling. It does these things not by creating an atmosphere inside the suit, but by mechanically compressing the whole body. This is why the unpressurized suit's gloves and boots are still pressurized- all the small joints in the hands and feet make it hard to compress their surfaces evenly and thoroughly. 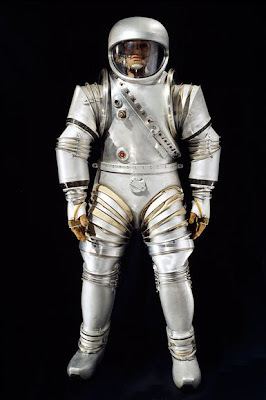 A prototypical unpressurized spacesuit, which compresses the body mechanically. Professor Dava Newman models the bio-suit. Needing to design a suit that would compress the body rather than be airtight, Prof. Newman drew on the experience of an Italian manufacturing company that produces carbon-fiber racing suits for European race car drivers. Unlike the unpressurized suit designed during the Apollo program, the bio-suit's material has elasticity. It stretches with the wearer, and it doesn't overly-compress a person wearing the suit in a pressurized atmosphere. The old-fashioned Apollo era unpressurized suit had no elasticity. Thus it would squeeze the wearer so tightly that if he or she wasn't in a vacuum, the circulation of blood would be constricted and he or she would pass out in less than a half hour! While the bio-suit has to be modeled specifically to fit each individual wearer's body, its materials and construction are so much simpler than pressurized spacesuits that it could still be dramatically cheaper to produce. And, as you can see from the above photo, the bio-suit allows normal movement. 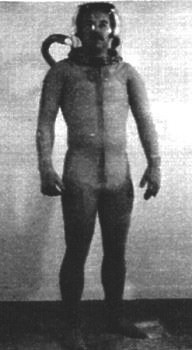 Unlike the Apollo astronauts, whose suits allowed only partial movement of the knees, elbows, and torso, a bio-suit wearer has a fairly normal range of motion. A puncture in the bio-suit won't threaten the air supply, either- you can just patch it with a bandage-like wrap. And, the bio-suit could weigh just a small fraction of the weight of a traditional, fully pressurized suit. Even without the air supply, an extravehicular activity suit still weighs over 100 pounds- which isn't a problem in micro-gravity, but would be a serious encumbrance to walking around on a planet like Mars. The suit looks really futuristic, doesn't it? Not that how it looks matters, of course! I think the bio-suit is so neat! But like so many amazing ideas for space exploration, Prof. Newman's project is not fully funded. 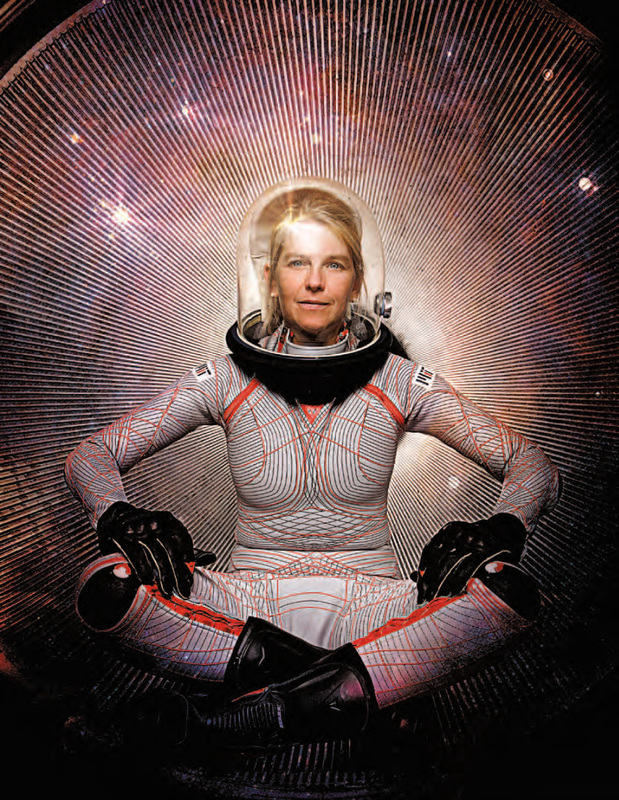 Her team has not yet produced a prototype that could safely be tested by actual astronauts in outer space. All research on the suit to date shows that it is a workable, useful concept. So, I hope one day folks can test it out in Earth orbit or beyond! Sources: NASA; Wikipedia; MIT; Slate; Spectrum.ieee.org; damninteresting.com.